Abdallah S. Jum'ah was born in al-Khobar in the Eastern Province of Saudi Arabia in 1941. He studied at the American University in Cairo and then at the American University of Beirut, where he was awarded the B.A. degree in political science in 1968. He joined Saudi Aramco's Government Affairs organization in April 1968 and in 1972 was assigned to Public Relations as general supervisor of publications and promoted to department manager in 1975. Mr. Jum'ah completed the Program for Management Development at Harvard in 1976. The following year he moved to Power Systems, where he began a series of assignments that closely involved him with the development of the Saudi Consolidated Electric Company (SCECO) in the Eastern Province. He was elected Aramco vice president, Power Systems, in 1981 and concurrently served as managing director of SCECO East, one of the forerunner companies which now form the Saudi Electric Company. Subsequently he served as vice president, Employee Relations and Training, and from 1984 to 1988 as vice president, Government Affairs. He became senior vice president, Industrial Relations, in 1988 with responsibility for the corporation's Medical Services, Community Services, and Employee Relations and Training. In October 1991 he was named senior vice president, International Operations, and a year later was promoted to executive vice president, International Operations. In this capacity he was responsible for all international sales and marketing, the development and coordination of joint ventures abroad, and for overseeing the operations of Vela International Marine Ltd. and other subsidiary companies. Mr. Jum'ah spoke to the educators about the close 70-year relation between Saudi Arabia and the U. S. He continued by saying that Americans are part of the Saudi Arabian heritage and that Saudi Aramco is very proud of it's heritage; the Saudi people want to help rebuild the bridge between Saudi Arabia and the U. S.
Educators then took a short bus ride to Ar-Rabiya where they visited Munira Al-Ashgar’s Gallery. Mrs. Al-Ashgar, the wife of retired former Saudi Aramco Senior Vice President, Saud Al-Ashgar, has created a wonderful museum on the grounds of her home consisting of Saudi Arabian artifacts that she has been collecting for a number of years. She started her collection with an old wooden bowl her mother-in-law gave her soon after her marriage. 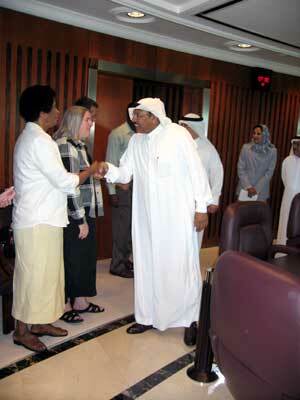 She has acquired museum pieces from around Saudi Arabia and the world. After the tour, Mrs. Al-Ashgar served the Houston educators traditional Arab snacks, tea and coffee. Later that morning, guests were taken to Dammam Well Number 7, where, in 1938, American owned Standard Oil Company of California (SoCal) made the first oil discovery in Saudi Arabia marking the first in what would become many spectacular accomplishments in the history of Saudi-U.S. cooperation in oil exploration. It took five years of pain-staking work under extreme desert conditions before the well now known as Dammam Number 7 hit oil in commercial quantities. 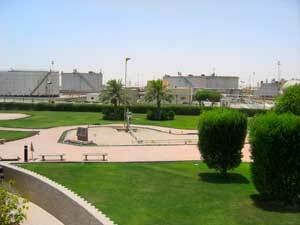 The discovery of oil transformed Dhahran from a desert oil camp in the 1940s to a modern city, and is now the site of Saudi Aramco’s headquarters. "The discovery well's name, determined months before, could not have been more prosaic: Dammam No. 7. Yet, of all the thousands of wells drilled in Saudi Arabia since, "Lucky No. 7," as it came to be called, is the mascot, the symbol of first success. Dammam No. 7 stands on a hill named Jabal Dhahran - the surface expression of the Dammam Dome - near a cluster of peaks called Umm al-Rus. Today, Aramco's gleaming high-tech Exploration and Petroleum Engineering Center (EXPEC) lies just up the road, and the company's headquarters community of Dhahran just beyond. The town, green and comfortable, is far different from the drilling camp it once was, and the silicone-chip and stainless-steel technology of EXPEC is light-years beyond that of the 1930's; nonetheless, Aramco has never lost sight of its geological roots. 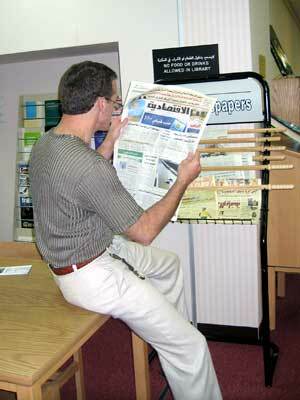 ...In 1982, after 45 years of nearly continuous output, Dammam No. 7 was taken out of production because of slack demand. However, the well is still capable of turning out about 1,800 barrels a day -and, as always, without a pump. And recently, "the mother of wells" produced what one might call a new child of sorts. No. 7's second wellhead, which had been in use from 1952 until 1978, was refurbished and mounted on a pedestal at EXPEC's entranceway as a symbol of the Aramco enterprise. The monument is a vivid reminder to all who pass by of how, on a nearby hill, Dammam No. 7 launched Saudi Arabia's petroleum industry 50 years ago." Next on the itinerary, Houston educators visited Saudi Aramco's Leadership Center where they received an overview and presentation on the numerous career development programs supported by the company. Saudi Aramco's recognition of the importance of ongoing education in the workplace is apparent in it's operation of one of the largest industrial training programs in the world. Employees are encouraged to seek educational opportunities supported by the company to upgrade their professional and vocational skills. The company offers on-line computer courses and classes taught by highly-skilled professionals in one of many Aramco Industrial Training Centers (ITC). For advanced training, it is not uncommon for employees to be sent to top-ranked training institutes overseas or to be sponsored on short-term learning assignments at other leading companies abroad. Abdulrahman H. Al-Ghussin, Superintendent for the Professional Training Division introduced Khawla Z. Abdelhamid, Principal, women's Career Development Center. Khawla Abdelhamid spoke to the group on the goals of Saudi Aramco's training curriculum for women. Saudi Aramco is forward thinking in its efforts to train its workforce and develop personnel talent. Internally, employees are not only provided the support and resources to be highly specialized and competent in their present positions, they are also given the tools to develop the necessary skills and learning to move on to management level positions within the organization. Externally, Saudi Aramco looks to the bright young talent of tomorrow, offering company sponsored college degree programs to select high school graduates. To this end, the Career Development Department is comprised of four divisions: the Saudi Development Division, the College Preparatory Program and Apprentice Administration Division, the Supervisory and Professional Development Division, and the Competencies Development Division. The Saudi Development Division is responsible for identifying organizational needs and individual competencies, establishing required programs, evaluating candidates' eligibility and monitoring their development programs. After receiving a presentation on the overview of Saudi Aramco's training programs, Abdulrahman Al-Ghussin accompanied the tour to the campus that houses the College Preparatory Program. The Mission of the College Preparatory Center is to prepare selected Saudi Arab high school graduates for admission to and success at competitive universities by providing a high quality dynamic and challenging program in which students learn in a cooperative environment under the guidance of a highly qualified and dedicated staff. 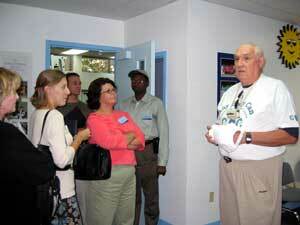 The group was taken on a tour of the campus where they met the instructors. The Supervisory and Professional Development Division is responsible for administering the corporate Management Training Centers that provide training and development programs for the professional and supervisory workforce. It also offers performance improvement consulting services to support development of employee competencies and organizational capacity for change. Finally, the Competencies Development Division guides professional workforce development through the Corporate Competencies Based Development Program. 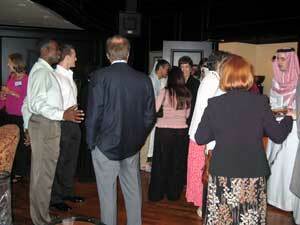 The Houston educators were invited to Sunset Beach where they enjoyed a wonderful dinner. Before dinner Bushra Abdullah Al-Eidy introduced them to The Saudi-American Exchange, a program which promotes education and cultural exchanges as a means of furthering "Understanding Through Communications".